1. 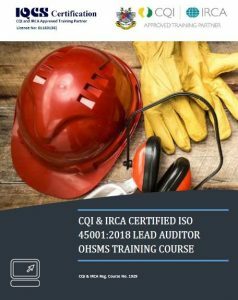 CQI & IRCA Certified ISO 45001:2018 Lead Auditor OHSMS Training Course (Public/In-house) - 1929 - NEW!!! CQI & IRCA Reg. Course No. 1929, Certified By CQI & IRCA (International Register of Certificated Auditor, UK). 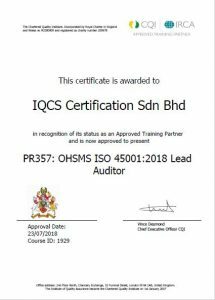 • This course meets the Chartered Quality Institute & International Register of Certificated Auditors Criteria, PR357 Course Specification: ISO 45001:2018 Lead Auditor OHSMS Training Course. • Explain the purpose of an occupational health & safety management system, of occupational health & safety management systems standards, of management system audit, of third-party certification and the business benefits of improved performance of the occupational health & safety management system. • Explain the role and responsibilities of an auditor to plan, conduct, report and follow-up an occupational health & safety management system audit accordance with ISO 19011, and ISO/IEC 17021, as applicable. • Plan, conduct, report and follow-up an audit of an occupational health & safety management system to establish conformity (or otherwise) with ISO 45001 and in accordance with ISO 19011, and ISO/IEC 17021, as applicable. • Explain the purpose of an occupational health & safety management system and the business benefits of improving occupational health & safety management system performances. • Explain the ISO 45001, PDCA cycle and QMS requirements. • Explain the purpose of, and differences between, a first-party, second-party and third-party certification audit of management systems, including the role of the OHSMS Auditor in evaluating an organization’s ability to meet the customer, statutory and regulatory requirements applicable to the products and services, and the organization’s own requirements. • Explain the benefits of third-party accredited certification of occupational health & safety management systems for organizations and stakeholders. • Explain the role of an auditor to plan, conduct, report and follow-up an occupational health & safety management system audit in accordance with ISO 19011 (and ISO/IEC 17021 as applicable). Skills are to be practiced and tested through tasks and in real, or simulated, audit situations. • The core elements of a management system and the interrelationship between top management responsibility, policy, objectives, planning, implementation, measurement, review and continuous improvement. • The fundamental concepts and the seven quality management principles (see ISO 9000) namely customer focus, leadership, engagement of people, process approach, improvement, evidence-based decision making and relationship management. An examination will be administered on the final day. The examination would cover the topics covered in the course and would last one hour. All the examination papers would be marked personally by the course tutor. The pass mark will be set at 70% and examination papers will be retained by IQCS. • Delegates with some understanding of the content, application, development and implementation of the ISO 45001 series of standards and who wish to subsequently practice as an OHSMS auditor. • Management Representatives, internal auditors, 2nd party & 3rd party auditors who are responsible to provide “value added” OHSMS audit to enable Continual Improvement. ^ Malaysia – Participants are eligible to apply for HRDF grant subject to HRDF approval. Participants are advised to obtain approval before training. ^ Singapore – Participants are eligible to apply for SDF grant subject to WDA approval. Participants are advised to obtain approval before training. 2. 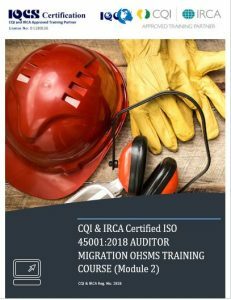 CQI & IRCA Certified ISO 45001:2018 Auditor Migration OHSMS Training Course (Module 2) (Public/In-House)-1928-NEW!!! CQI & IRCA Reg. Course No. 1928 (Module 2), Certified By CQI & IRCA (International Register of Certificated Auditor, UK). • This course provides the knowledge of the changes to the revised OHSMS standard and the skills to audit against the revised standard. It is recommended for professionals working in organisations certified to OHSAS 18001:2007 that has been revised or those looking to work with a newly revised standard. •Know and understand the requirements of ISO 45001:2018. This module should be delivered over a minimum of a day, where a day consists of eight hours, including breaks. • External and internal issues, and the relevant interested parties and their relevant needs and expectations. • Documented scope of the OHSMS has been determined in consideration of above and the organization’s planned or performed work-related activities. • Top management has taken overall responsibility and accountability for the prevention of work-related injury and ill health, as well as the provision of safe and healthy workplaces and activities. • Organisation’s processes for the consultation and participation of managerial and non-managerial workers. • Organisation has planned its OHSMS after consideration of its context , requirements and scope, and has determined the risks and opportunities that it need to address in order for the OHSMS to achieve its intended outcomes, to prevent or reduce undesired effects, and to realize continual improvement. – responding to potential emergency situations and that the organization has planned actions to address these. • All CQI & IRCA Certified OHSMS Auditors must successfully complete a CQI & IRCA Certified ISO 45001:2018 Auditor Migration OHSMS Training Course (Module 2) by quarter 1 Year 2021, in order to retain their CQI & IRCA OHSMS registration. • Individuals who have previously completed CQI & IRCA Certified OHSMS Training and have chosen not to register with CQI & IRCA. Migration training will offer valuable skills for any auditors who wish to keep their audit skills and knowledge up-to-date. Understand and accurately interpret the requirement of the OHSMS 45001 specification its ‘PDCA’ model and their scope & field application. Plan, prepare & based on “Significant OHS Risk” Audit Trail, perform and report OHSMS audits. Target :Management Representatives, Internal OHS Officers/OHSMS Auditors and mission specific personnel. The identification of significant occupational hazard and risk, its relevance and importance to your job performance. Awareness of Emergency preparedness and reponse. Target : Supervisory level and operations staff. The development and maintenance of OHSMS Documentation and Records management with respect to significant hazard and risk. Target : Middle management, engineers/supervisors, document controllers and those who are mission specific. Technique, Tools & Strategies to identify hazard and assess risk. Target : Executives who have no time to attend lengthy course are provided with vital information on OHSMS Concept, Strategy for Implementation & Status Analysis and Certification Achievement. We provide in-house and public training for all company sizes. 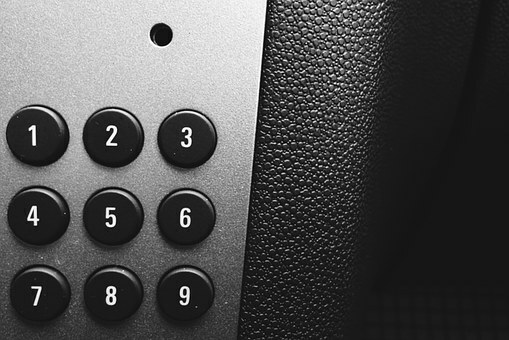 Find who is representing in your region by clicking here, or leave us a message here and we shall turn around the quotation or referring our local representative to you.